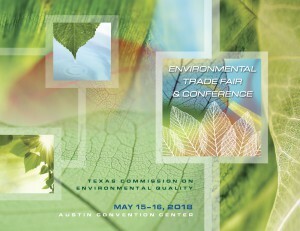 DBS&A will exhibit at the 2018 Texas Commission on Environmental Quality Environmental Trade Fair and Conference (TCEQ ETFC) on May 15-16, 2018, in Austin, Texas. The two-day conference features over 100 classes on air and water permitting, oil and gas, industrial and solid waste management, compliance and enforcement, and remediation programs. Meet DBS&A’s President, Jim Kelsey, P.G. ; Vice President and Senior Scientist, Kevin Hopson, P.G. ; Geologists, Paul Kirby, P.G., Kathy Vail, P.G., Russell Perry, P.G. ; Lubbock Operations Manager, Todd Seebaum, C.A.P.M. ; Hydrologist, Stephanie Moore, P.G. ; Senior Engineer, Gundar Peterson, P.E. ; Marketing and Communications Director, Janet Wolfe, C.P.S.M. ; and Geo-Logic Associates (GLA) Senior Project Manager, Douglas Junk, at exhibit #327 to discuss solutions to the environmental issues that Texas is currently facing. Read about the Assessment, Investigation, and Remediation Services that DBS&A has provided to TCEQ since 2009 here. For more information on DBS&A’s remediation services, here. For more information about the conference, here. Dr. Joe LeClaire will be presenting on the recently released “Southern California Salinity Coalition Study to Evaluate Long-Term Trends and Variations in the Average Total Dissolved Solids (TDS) Concentration in Wastewater and Recycled Water” at the WateReuse Inland Empire Chapter meeting on May 8, 2018. Click here to read more about the Study. New Mexico Water, a joint committee of the Rocky Mountain Section of American Water Works Association (RMSAWWA) and Rocky Mountain Water Environment Association (RMWEA), is hosting the 2018 4th Annual New Mexico Water Workshop on April 26 and 27, 2018, in Albuquerque, New Mexico. This year’s workshop theme is “Emergency Planning and Preparedness: Be Prepared New Mexico.” DBS&A is sponsoring the event, and the firm’s engineers and hydrogeologists will present on important topics, such as: Rehabilitation of Rio Rancho Well No. 3 – Challenges, Hazards and Successes by Hydrogeologist Robert Gray, P.G. City of Albuquerque Microbial Source Tracking Program by Hydrogeologist Chad Johannesen, P.G. Reuse and Recharge Site Selection, Permitting, and Design by Engineering Intern Liie Hill, will present on Reuse and Recharge Project Examples in the Southwest U.S. by Senior Engineer Jennifer Hill, P.E. For more information on DBS&A’s water resources services, click here. Click here for more information on the conference. Hydrologist Stephanie J. Moore, P.G., will present on Collaboration for the Albuquerque Municipal Separate Storm Sewer System (MS4) Watershed Based Permit at Texas Water 2018 from April 24-26, 2018, in San Antonio. DBS&A Engineer Jennifer Hill, P.E., and DBS&A Hydrogeologist Chad Johannesen, P.G., are co-authors of the presentation. Click here to learn about DBS&A’s stormwater management expertise. Texas Water 2018 is the largest regional water conference in North America. The conference is a joint effort of the Texas Section of the American Water Works Association (AWWA) and the Water Environment Association (WEA) of Texas. Click here for more information about the conference. Collaboration and the Albuquerque MS4 Watershed Based Permit presented by Stephanie Moore, P.G. The U.S. Environmental Protection Agency’s (EPA) MS4 Stormwater Program is intended to improve the Nation’s waterways by reducing the quantity of pollutants transported into receiving bodies of water during storm events. Common pollutants include oils and grease from roadways, herbicides and pesticides from landscaping runoff, and sediment from construction sites. When deposited into nearby waterways, these pollutants can impair the waterways, discouraging recreational use of the resource, contaminating drinking water supplies, and degrading with wildlife habitat. The watershed based permit encourages collaboration between co-permittees by reducing monitoring requirements and extending permit deadlines for organizations that collaborate. Collaboration can either occur on limited conditions of the permit, or on many, or all conditions of the permit. Collaboration can be between two parties or multiple parties on the permit. For the Middle Rio Grande watershed, 12 of the 17 co-permittees are currently collaborating on the required water quality monitoring. This collaboration dramatically reduces the number of monitoring locations, and the monitoring program costs. The Phase 1 National Pollutant Discharge Elimination System (NPDES) stormwater program, promulgated in 1990, requiring operators of medium and large MS4s (generally communities with populations >100,000), to implement stormwater management programs. The Phase II rule extends coverage of the NPDES program to certain “small” MS4s. The Phase II rule automatically covers all small MS4 located in urbanized areas (UA’s) as well as small MS4 communities located outside of UA’s that the NPDES permitting authority designates on a case-by-case basis. There are six program elements of the MS4 program: 1) public education and outreach, 2) public participation/involvement, 3) illicit discharge detection and elimination, 4) construction site runoff control, 5) post-construction runoff control, and 6) pollution prevention/good housekeeping. The Middle Rio Grande watershed was one of three areas nation-wide to receive a permit under EPA’ s pilot program. The other areas include Ramsey Washington Watershed District in Minnesota, and Milwaukee Metro Watershed in Wisconsin. 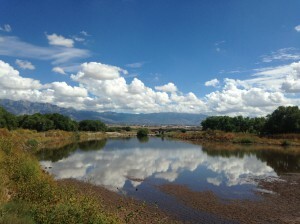 The Middle Rio Grande watershed has 17 co-permittees, including municipalities (small and large), two counties, the University of New Mexico, two flood control districts, three Native American tribes, the State fairgrounds, and Sandia National Laboratory. This presentation will provide an overview of the MS4 watershed based permitting program, and give examples from the Middle Rio Grande watershed Phase I and Phase II projects, highlighting the collaborative efforts being used to meet the permit conditions. The Santa Ana Regional Water Quality Control Board has adopted DBS&A’s ambient water quality determinations for total dissolved solids (TDS) and nitrate-nitrogen for all 37 of the groundwater management zones (GMZs) contained within the 2,840 square-mile Santa Ana Watershed in 2015. DBS&A’s submittal of the updated 2015 TDS and nitrate-nitrogen ambient water quality (AWQ) determinations and assimilative capacity findings was accepted by the Santa Ana Water Board on March 23, 2018 as part of ongoing efforts to mitigate Basin Plan watershed salt loads. The Santa Ana Water Board’s acceptance further resolved that DBS&A report findings of ambient water quality was in compliance with the Salt Management Plan Monitoring Program Requirements that address TDS and nitrate in surface water and groundwater. 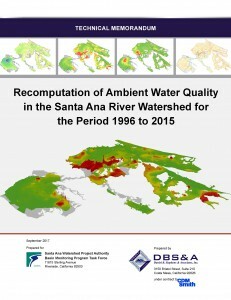 The 2015 ambient water quality determinations are currently being incorporated into the Santa Ana Watershed Project Authority’s One Water One Watershed (OWOW) 2018 Update to the Integrated Regional Water Management (IRWM) plan. DBS&A’s TDS Trends Study, recently completed for the Southern California Salinity Coalition and the National Water Research Institute, by DBS&A is also being incorporated into the OWOW update. Click here to learn more. Resolution No. R8-2018-0027 can be found online here.